The stadium has been completely re-developed in recent years and the predominantly old terraced ground has now been transformed into a modern all seated stadium. Although not particularly large for a national stadium, it still retains its charm and individual character which is enhanced by it's completely enclosed oval shape. Three sides of the stadium are single tiered, but the South Stand on one side of it, has a small second tier, which slightly overhangs the lower one. Normally this may mean that the stadium would look imbalanced, but it has been well integrated with the rest of the stadium with oval stadium roof rising gently towards this stand. There are also two electric scoreboards which are suspended underneath the roofs at either end of the stadium. One unusual aspect of the stadium is that the team dugouts are actually situated six rows up on the South Stand. This is to allow team managers to get a better view of the game. Only part of the BT Scotland South Stand is open for Queens Park games and normally segregation of fans is not enforced. Two turnstiles P & O which are open for each game are located to the left of the main entrance. 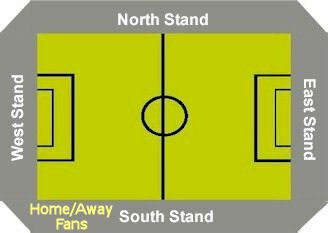 If segregation is in force, then away fans use turnstiles I & J, which are located to the right of the main entrance. The facilities within Hampden are great, plus the leg room and view of the playing action, are also both good. On the good sized concourse there is a small club shop and refreshments on sale include; Steak Pie (�1.90), Scotch Pie (�1.40), Macaroni Pie (�1.70), Cheeseburger (�2.70) & Chips. Although a pleasant afternoon out, crowds of around the 5-600 mark, in a 52,500 seater stadium, does little for the atmosphere. In fact at times, you would be thinking that you were attending a reserve match, with the players' voices echoing around the ground. Still the p.a. system stills booms around the stadium before the game and at half time, the electric scoreboards are in operation and there is still a game of football to watched. On my last visit against Albion Rovers, five minutes before kick off, there was a fair queue for refreshments. An Albion fan shouts to his friend in the queue; 'Hurry up Willie, or else we'll not get a seat!'. That brought a smile to my face considering that there were around 52,000 empty seats inside the stadium. There is the Queens Park Social Club, in Somerville Drive (adjacent in office accommodation to the nearby Lesser Hampden ground), which allows in away fans. Otherwise there are a number of bars and chippies around the area of the stadium. My favourite is the Clockwork Beer Company on Cathcart Road (going away from the city centre). This spacious pub brews its own beers and stocks a wide range of whiskies. Leave the M74 at Junction 1 and turn left at the roundabout into Fullarton Road, following the signs for Rutherglen. Go straight across the next roundabout and at the following roundabout turn right into Cambuslang Road. You will cross over the River Clyde and then continue to the end of this road. At the traffic lights turn right and continue along Main Street Rutherglen and then on towards Mount Florida. Continue straight along this road until you reach the large Asda Store at which you turn left into Aikenhead Road. The stadium is up this road on the right hand side. There is a large free car park, behind the South Stand. The nearest stations to the stadium are Mount Florida & Kings Park. Both are served by trains from Glasgow Central (journey time around 10-15 minutes) and are around a five minute walk away from the stadium. Parent + Child: �10 per adult, plus �1 per child. Concessions apply to OAP's, Under 16's, Students & the Unemployed. Official Programme �2 (available within the stadium). For the Queens Park fixture list click here (to take you to the BBC Sports Website). 44 wheelchair spaces are available within the South Stand, as well as provision for an accompanying carer. There are also 55 places for ambulant/blind persons (guide dogs are allowed). Disabled supporters and their carers are admitted free. Places do not normally have to be pre-booked but it would be of courtesy to the Club to do so by calling them on 01224-650423. For all those ground enthusiasts out there, then make sure you take a peak at the old lesser Hampden, behind the West Stand. This is a small old ground, that has quite a quaint looking stand at one side of the pitch. In the past it has been used by Queens Park reserves, as well as for the odd first team outing. The stadium is also the home of the Scottish Football Museum, which opened it's doors in May 2001. I was thoroughly impressed not only with the standard of museum, but also the vast array of items that can be seen. From a ticket from the first ever Football International held in Glasgow in 1872, to an exhibition of football related 'toys'. The current Scottish Cup is also available to view within the museum. What I particularly liked was the emphasis on the fans involvement in the Clubs, from the first fanzines to the Tartan Army. The museum is a must for any true football supporter. The museum is open daily from 10.00am to 5pm (Sunday's 11am-5pm, Last admittance all days - 4.15pm). Entrance costs �5.50 for adults and �2.75 for concessions. Tours of the stadium are also available on non matchdays for an additional charge of �3 adults, �1.75 concessions. Alternatively if you wish you can just book a tour of the stadium which costs �6 adults, �3 concessions. If you have an enquiry you can ring the museum on 0141-616-6139. Queens Park offer on matchdays a joint 'museum entry and matchday' ticket for just �10. 149,415 - Scotland v England, 1937. This is the record for the largest attendance at a football match in Britain. If you require hotel accommodation in the area then first try a hotel booking service provided by Football Hotels who are powered by Activehotels, who specialise in locating accommodation near or within a short travelling distance of the football ground. They also have the added advantage over some other hotel booking services that you pay on departure. Yes this site will earn a small commission if you book through them, but it will go to help with the running costs of keeping the Guide going. To access their Glasgow page click here.